It's that time of year again! Teachers Pay Teachers is having a Cyber Monday and Tuesday sale. I am excited to finally purchase those resources that have been sitting on my Wishlist! Between teaching resources and clip art I have 57 items to purchase--thank goodness for those TPT credits. 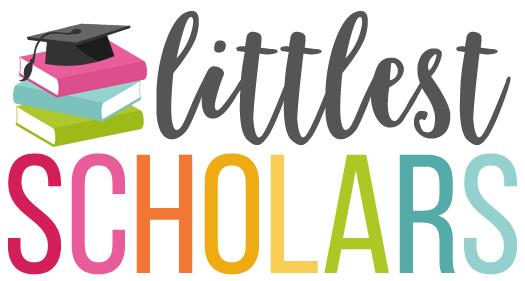 I'm linking up with my friend Jen from Teaching in the Tongass to share the teaching resources from my TPT shop that have been most frequently wishlisted by other teachers like you! Click the picture to see the resource! 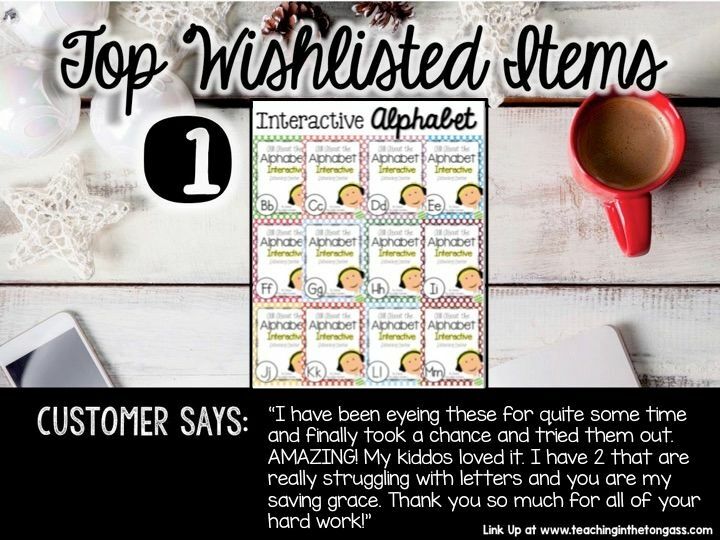 My All About the Alphabet Interactive Listening Center Bundle [Part 1] has made it on a whopping 929 Wishlists! This resource is one of my favorites because I saw firsthand what an impact it made on my little scholars mastery of letters and sounds. The download includes a printable booklet and audio file for each letter A-M (letters N-Z are in the All About the Alphabet Interactive Listening Center Bundle Part 2). The beauty of this resource is that the audio file actually does the teaching for you! I also use this resource to reinforce learning at home--my little scholars just take home the printable booklet and a CD player home for extra practice. This is especially helpful for those that might not have support at home or your English Language Learners. You can download the Letter Aa Interactive Listening Center [here] for free to give it a try! I recently added a full-page version of each printable booklet to the download to make prep even easier! No laminating and cutting--just place each page in a sheet protector and use a binder ring to keep all the pages together! If you aren't the most tech-savvy and would rather have the audio files mailed to you on a CD, you can add that to your cart with your purchase [here]. Take advantage of the sale and purchase the bundle for 28% off. 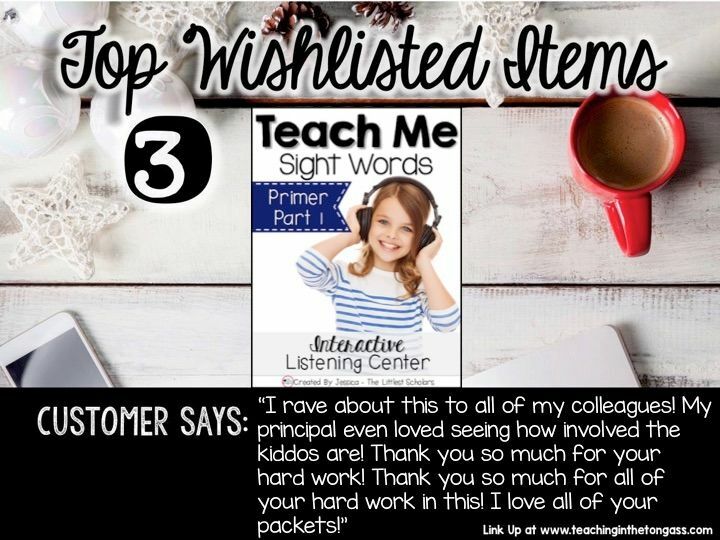 Rounding out the Top 3 Wishlisted Items from my TPT shop is my Teach Me Sight Words Primer Bundle Part 1. After seeing the impact my All About the Alphabet Interactive Listening Center had on my little scholars letters and sounds mastery, I created a version for sight words! This download includes a printable booklet and audio file that actually teaches the sight words. While your little scholars are interacting with the audio file and printable booklet, they are listening to the sight word being spelled and read over 26 times! This resource also teaches the sight word in the context of a sentence, which research indicates leads to greater mastery of sight words. Set this up as a listening center in your classroom, change out the sight words as you teach them according to your own scope and sequence, and you can just sit back and watch your little scholars learn to read, spell, and write those sight words! 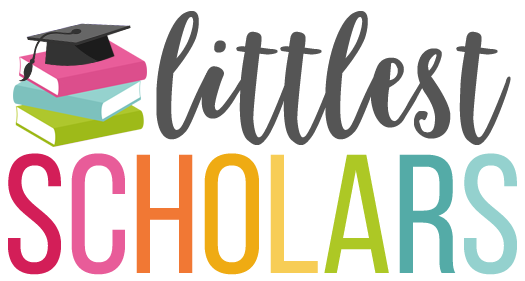 Just like my All About the Alphabet Interactive Listening Center, you can print the booklets and send a CD player home to give your struggling scholars more practice! You can download the Teach Me Sight Words Sampler to try it out for free [here]. If you aren't the most tech-savvy and would rather have the audio files mailed to you on a CD, you can add that to your cart with your purchase [here]. I have bundles for Dolch and Fry words as well as each sight word listed individually. Grab all my Teach Me Sight Words resources during the Cyber Monday and Tuesday sale for 28% off the already reduced bundle price! Click the picture to start shopping!